Pittsford native Cynthia Kolko, following the release of her first novel, â€œFruit of the Vine,â€ will visit Lakeland Winery from 1-3pm on July 9, 2011. Attendees will be able to meet the author, get signed copies of the book and chat about wine and the Finger Lakes. Books are $14.95 and will be available for purchase at Lakeland Winery and can also be purchased through Barnes & Noble, Amazon and www.cynthiakolko.com. Readers can connect with Kolko on her website, www.cynthiakolko.com, the bookâ€™s Facebook page at www.facebook.com/FruitoftheVine, and Cynthiaâ€™s Twitter feed at www.Twitter.com/CynthiaKolko. Cynthia Kolko graduated from Hamilton College with a bachelorâ€™s degree in English. She has worked as a corporate, advertising and editorial writer, and as a broadcast scriptwriter. Her writing has been published in many periodicals including P.R. Journal, How, Interactivity, Progressive Railroading, Rochester Business Journal, and the Democrat and Chronicle. 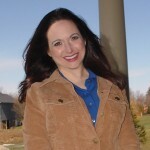 Kolko lives with her husband and two children in her hometown of Pittsford, NY.